Looking for a light and healthy appetizer or meal? 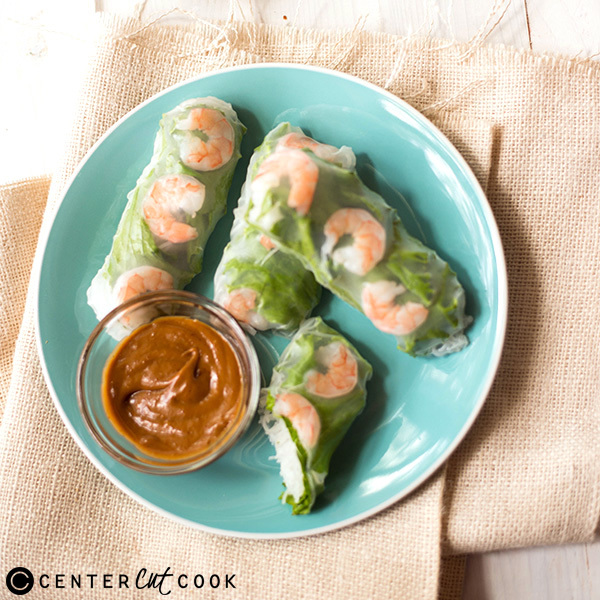 Try these Shrimp Spring Rolls with Peanut Dipping Sauce and you’ll be all set! 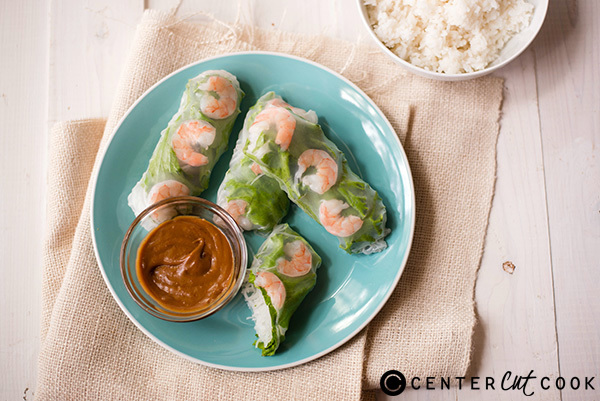 When you’re in the mood for something light and fresh, spring rolls are a great option. They’re filled with fresh and crunchy vegetables, like lettuce, bean sprouts, cucumber, carrots, and mint leaves so every bite is full of crisp texture. Pair that with the savory shrimp and vermicelli noodles and you have a very interesting and exciting combination of flavors and textures. I highly recommend you make this peanut dipping sauce to go with the shrimp spring rolls. The combination of creamy and rich peanut butter, hot Sriracha, and pungent rice wine vinegar is so addicting and delicious, you may find yourself finishing up the sauce even once the spring rolls are all gone. Plus, the sauce only takes a minute to make and can be done in the microwave so it’s a super fast and easy recipe to try that makes a huge difference in the flavor. If you’ve never purchased vermicelli noodles or round rice paper before, they are typically either in the International or Pasta sections at the grocery store. 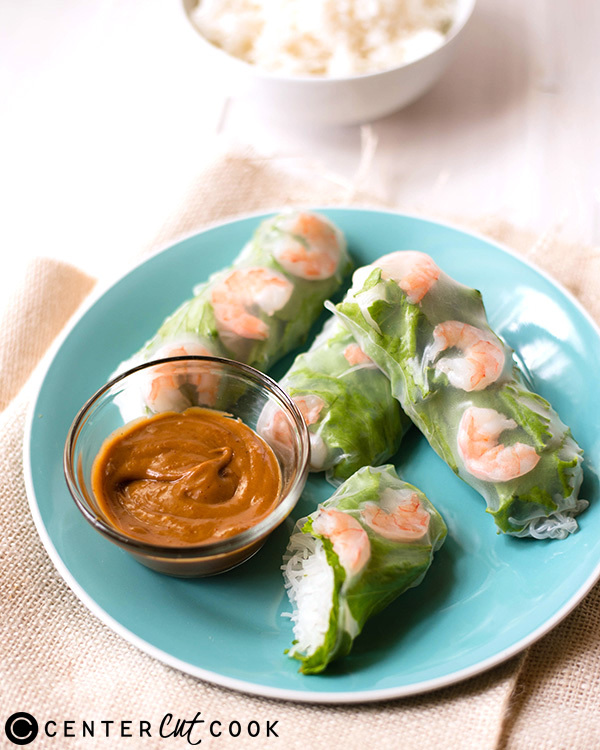 Or, if you’d rather keep this healthy snack even lower carb, you could wrap the rolls in whole lettuce leaves instead of using the round rice paper. You won’t get quite the same texture, but it’ll still be tasty. Boil the shrimp in a medium pot of water to cook through. Set aside to cool. Once cool, slice the shrimp in half lengthwise. Bring the same pot of water to a boil. Remove from heat and add the vermicelli noodles. Let soften for about 8-10 minutes. Drain thoroughly and rinse with cool water. Dip one wrapper at a time in hot water for about 10-15 seconds. Lay flat on a cutting board and layer ingredients on bottom third of wrapper. Fold the bottom of the wrapper up over the ingredients. Fold in sides, then continue rolling up. Place seam side down on plate. In a small, microwave-safe mixing bowl, combine the peanut butter, hoisin sauce, Sriracha, and rice wine vinegar. Stir, and then heat for 10 more seconds.